Henry Gee. Free Press, New York, 1999. 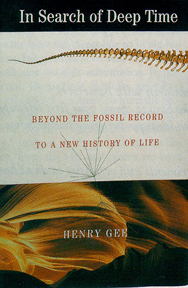 Henry Gee (pronounced like the letter) is an editor and senior writer at the weekly science journal Nature. He has a PhD in paleontology, and in this book he recounts the revolution that has taken place in the last decade as cladistics and Linnaean systematics have battled for the soul of evolutionary biology. Like all paradigm shifts, this one has been accompanied by ferocious disagreements, and Gee very much represents one side of the argument, the upstart cladists. But he does a great job of clearly explaining the working of this powerful new analytic tool. We have very little direct information about deep time, about the past of dinosaurs and Australopithicenes. We have to reconstruct evolutionary history from bits and pieces. The great power of cladistic analysis, the reason for its overwhelming impact on evolutionary biology, is that it is at every point testable. Gees writing is enrich with wit and a sense of fun, but make no mistake: the issue he is exploring is an important one, one that is reshaping how we think and agrue about the history of life.